Nothing beats the taste of chicken on the grill at a backyard BBQ. I’m tired of serving the same ol’ hamburgers and hotdogs at our summer parties. Sure, they are easy to make, but I was just getting bored of eating them. It’s fun to switch up your dinner rotation and try some new recipes. Lately, I’m all about chicken! Not only is chicken easy to make on the grill, but it’s also so versatile. Chicken goes with just about everything. You can dress it up fancy with marinades and rubs, stuff it with some veggies or even fruit or try it plain dipped in barbecue sauce. It’s almost fool-proof and as they say, “anything goes”! BBQ season is starting soon for us and it may already be BBQ season where you live. For me, it depends on the weather. Once the nice weather hits, we roll out the grill, fill up the propane tank and bring out the patio furniture. If I’m remembering correctly, it’s usually mid-May that this all goes down. Then you can frequently see either John or myself out in the backyard grilling our supper. Great grilled chicken recipes, so many to try! The Grilled Greek Chicken Family Style with Feta Tzatziki Sauce is probably my fave. Grilled chicken tzatziki is probably my most favorite summer food. I could eat that everyday! Thanks for these recipes. I love grilled chicken. Thanks for the awesome recipes!!! We mostly eat chicken and I’m always looking for great new recipes to try. Grilling meat is such a healthy way to cook it so thanks for this! I can’t wait to get out and cook some chicken on the grill! Thanks for the recipes! I will enjoy trying these recipes, mahalo! I like these recipes-especially easy recipes like these. I love grilled chicken these are some fab recipes !! thank you! Oh Chicken is probably my favourite meat done on a grill! thank you! Awesome recipe! I’ll have to try it! Thanks for these recipes! We use to eat a lot of chicken so they are welcome. (15 Easy Grilled Chicken Recipes) So many good ways to turn boring chicken into a piece of artwork. I like a lot of these great recipes, thanks for sharing them. These all look delicious can’t wait to try some of them! Now who doesn’t like grilled chicken? These are awesome recipes to try on the grill. I love “The Best Grilled Chicken Recipe” ever and I will try it first.Thank you. I am always looking for good low cal recipes with chicken. Thanks. The mustard chicken sounds like a must-try! Makes me eager for BBQ season to get here! saving these! look so good! 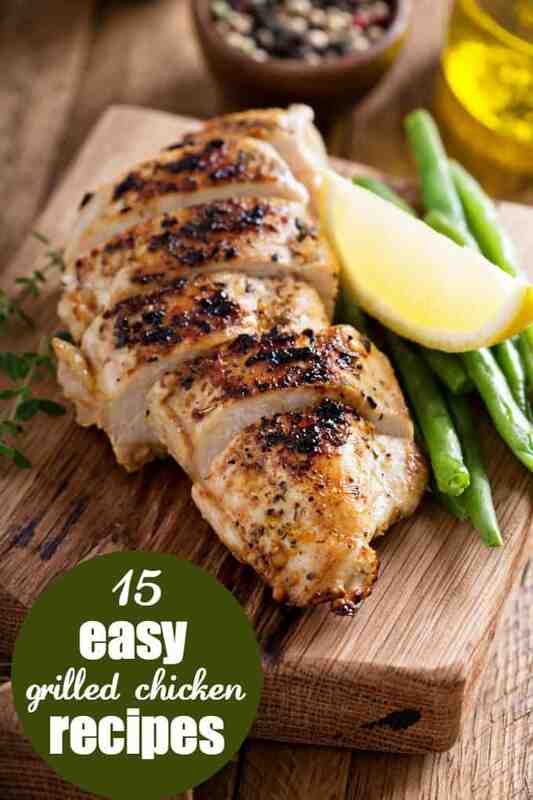 I love grilled chicken, I’m going to check out these recipes! Thank you for these. We use a lot of chicken and I am trying to break out of the boring some old thing we have gotten into. This looks like a great collection of chicken recipes. We love chicken in my house. You have some awesome recipe here for chicken lovers like me.Thanks for posting them. The bacon-wrapped maple mustard chicken looks really delicious. Always looking for new chicken recipes as repeating the ones I have gets old after a while. Thanks for sharing! Its sounds easy enough but im not much of a cook but ill try. Love grilled chicken. I am always looking for new way to cook it. Thank you for sharing. Thank you for sharing these recipes. My husband loves to grill.